Thank you to Dan MacMeekin for supplying the images above. Dan MacMeekin has asked for the approximate date of this photo. I've not been able to discover when Turnbull & Sons wee based in Greenock. 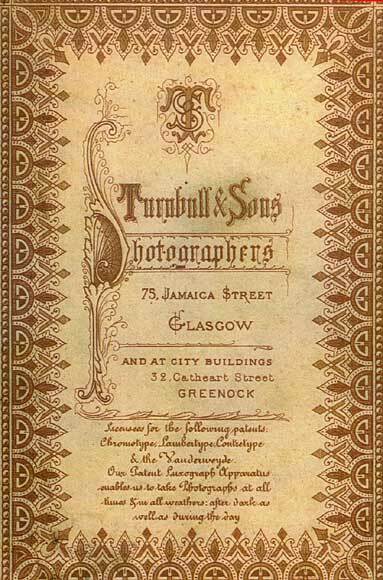 They were based in Glasgow from 1865 to 1884. 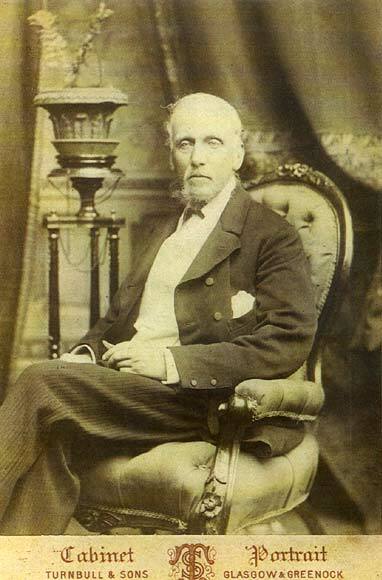 The fashions, looser suits, lounge suits with deep cuffs and non-matching waistcoats suggest that the photo may have been taken around 1870. If you can provide a more accurate date (possibly referring to a Paisley trade directory) please email me so that I can pass on the answer. Thank you to Dan MacMeekin for letting me know that he has now discovered more about the photograph above. "A revelation - this photograph has been identified by a New Zealand relative of mine as Thomas McMiken, 1816-1888, of Gatehouse of Fleet. He was one of my great-grandfather's brothers. The back of the cabinet print above states that Turnbull & Co are licensees for the Chromotype and other processes. "By the way the image of the gentleman seated in the chair does not appear to be a Chromotype as the highlights appear faded and burned. Carbon/chromotype prints are noted for the skin tones and do not fade. Many photographers bought the rights to the processes but soon found it was too difficult, or that there were easier ways to make prints. They continued to promote that they offered Chromotype and Lambertype prints. The bromide print came in about the 1880s and overtook the market." For further details of the Chromotype process and its history, Robert Lansdale recommends reading Audrey Linkman's article in 'Photographica World' (issue #91, Winter 1999/2000).